The Harmar Fusion Power Chair or Scooter Lift offers the convenience and versatility to carry a power chair or scooter with one lift. Compatible with virtually all scooters and power chairs, safely secures the mobility device with four, easy-to-operate, Q'Straint retractors. When empty, the platform automatically folds up and out of the way with the flip of a single switch. Aluminum Deck Size: 27.5" - 39", adjustable cradle extends up to 46"
The Swing Away Option allows an unoccupied outside lift to be easily pivoted away from the vehicle to gain clear access to the trunk, lift gate or tailgate. Please Note: If this item is selected you will need to add 1" to your hitch height. Weighs 40 lbs. The Battery Pack Option eliminates the need for wires to be run from the lift to the automobile battery when installed, thus reducing installation time, cost, and complexity. 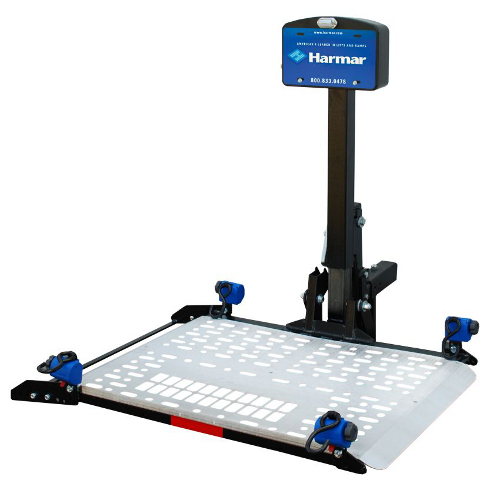 All of Harmar's power lifts have the option of selecting their own 12 volt power supply which easily recharges by plugging the unit into any standard wall outlet. By using the battery pack option, the lifts can be easily transferred from one vehicle to another.